With equities seeing a major reversal from the Monday gains, the VIX rebounded, settling +11.5% @ 13.64 (intra high 14.33). 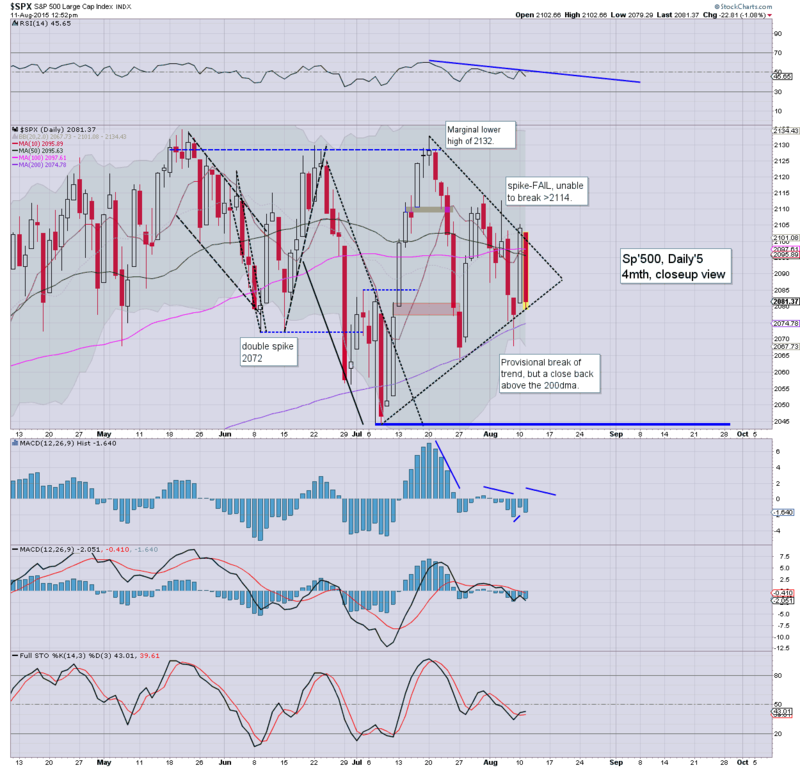 Near term outlook is for the sp'2050/40s, which should equate to VIX 16/17s. 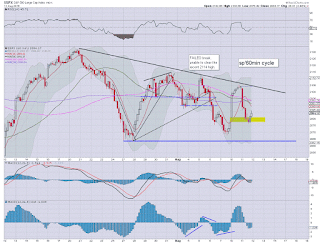 The big 20 threshold looks difficult in the current cycle. 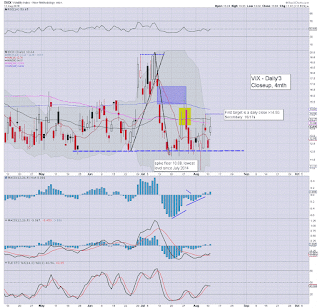 *closing hourly candle was again indicative of the VIX remaining broadly subdued. 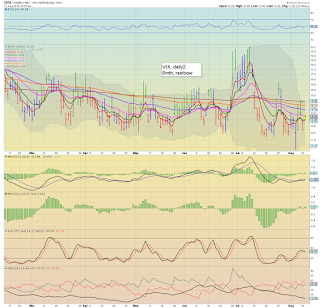 So..a sig' net daily gain for the VIX, but the VIX is still relatively low. There is obvious resistance in the mid 14s, and it was pretty disappointing to see the VIX close in the 13s today. 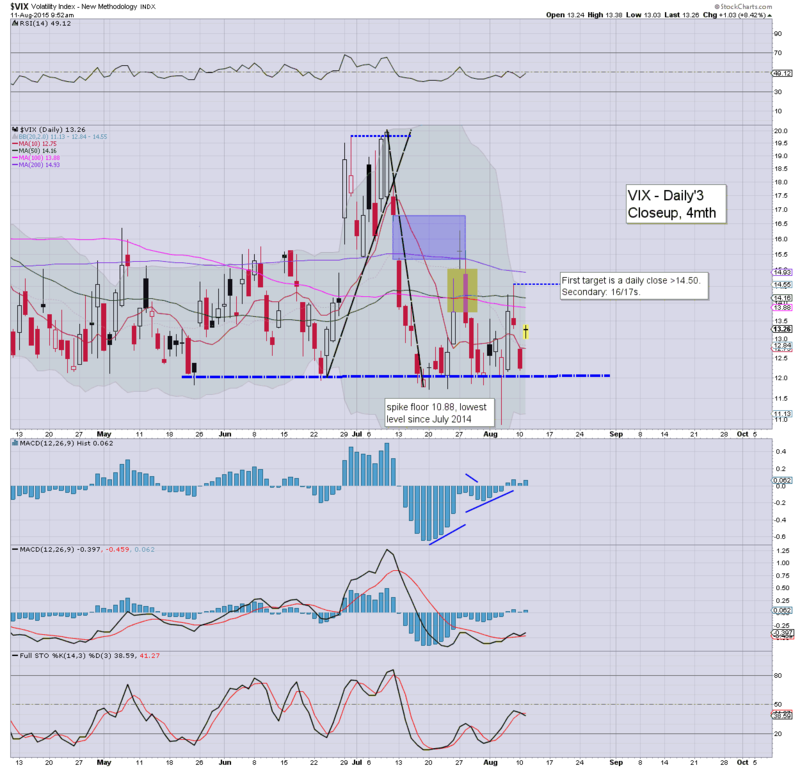 Overall though.. considering yet another equity reversal... VIX in the mid/high teens looks viable in the near term. *I hold long-VIX.. seeking an exit in the 16/17s.... but my patience is wearing a little thin. US equity indexes closed significantly lower, sp -20pts @ 2084 (intra low 2076). The two leaders - Trans/R2K, settled lower by -0.6% and -1.0% respectively. With the full reversal of the Monday gains, near term outlook is back to bearish, first target is the sp'2050/40 zone.. which (in theory) should equate to VIX 16/17s. *closing hour... moderate upside chop. Despite the market clawing higher in the late afternoon, it was still unquestionably a day for the equity bears. More than anything, the fact that the Friday close was broken under during today was a powerfully bearish signal for tomorrow.. and probably, the rest of the week. Anyone feeling overly 'buy the dip'.. I refer you to the charts for AAPL and DIS... (soon to be posted) on my 'fair value' page. Both are highly indicative of increasing weakness in the broader market. *the usual bits and pieces across the evening.. to wrap up the day. 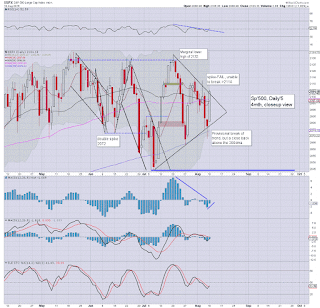 US equities are set to close significantly lower, having seen a full reversal of the 'Monday nonsense'. VIX is pushing for a close above key resistance around 14.50. Commodities remain mixed, Gold +$5, whilst Oil remains in collapse mode, -3.4% in the $42s. ... I am somewhat tired (dealing with housing issues today), frankly, the market is not actually in the forefront of my mind. I could care less today.. Regardless of the exact close, today is a major victory for the equity bears.. after yesterday's nonsense. *I continue to hold long-VIX.. and short INTC. Both positions are annoying.. and I will be glad to drop them for gains, whether tomorrow.. or later in the week. US equities are seeing a particularly severe reversal of the 'Monday nonsense', having now taken out the Friday close of sp'2077. VIX is still battling hard to break key resistance in the mid 14s. 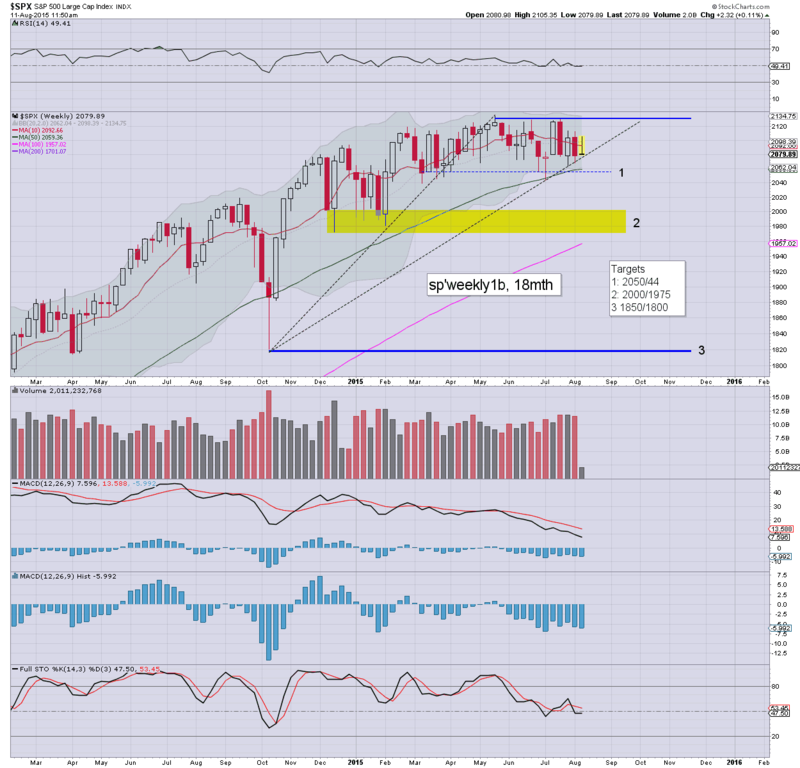 Considering the reversal.. the sp'2050/40s are now on the table... along with VIX 16/17s. *death crosses for the Dow and NYSE comp' today. So... there are periodic nano up cycles, but we're set for a significant net daily decline. More than anything though... it is the fact that we saw the Monday gains fully negated.. THAT is very bearish. 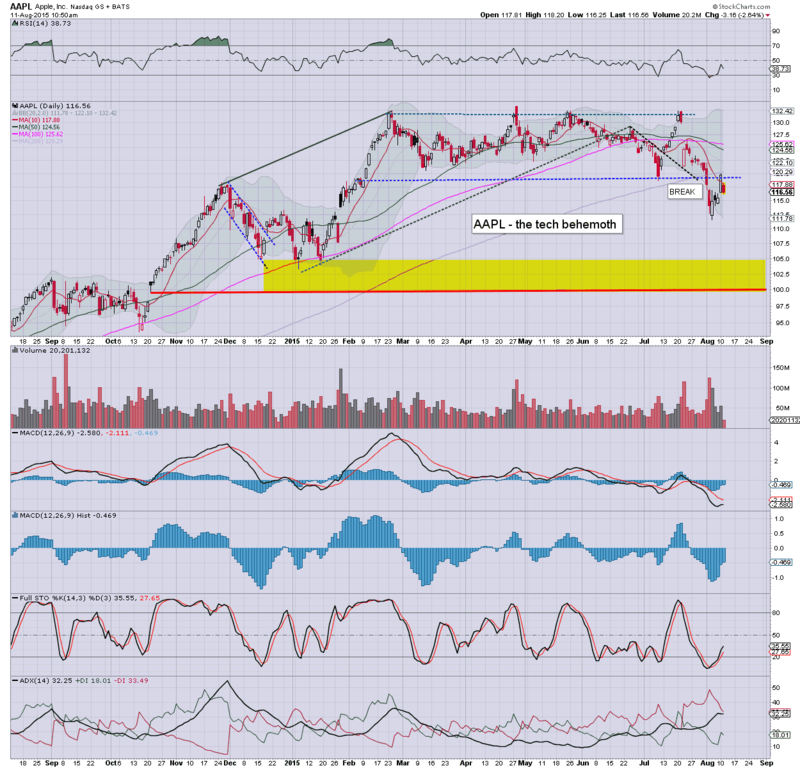 notable weakness: AAPL -4.9% in the $113s... its getting real ugly in that one. strength: US bonds, TLT +1.6%... back on track.. after the Monday decline. 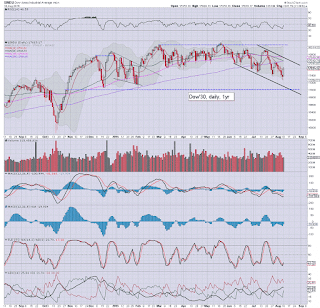 US equity indexes see a little chop in the sp'2079-84 zone, but remain broadly weak. VIX is +13% in the 13.90s, but clearly.. is still relatively low. With the USD +0.2% in the 97.30s, metals are already starting to struggle, Gold +$5, whilst Oil is back in collapse mode, -3.4% in the $42s. The daily close will be very important.. not least for those long VIX. Best case.. sub sp'2077... which should just about result in VIX >14.50. If that is the case at 4pm today... it bodes for more significant downside tomorrow. 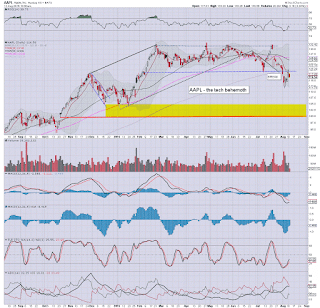 notable weakness: AAPL -4% in the $114s.... the 119s are now fading away.... $100 looks highly probable. 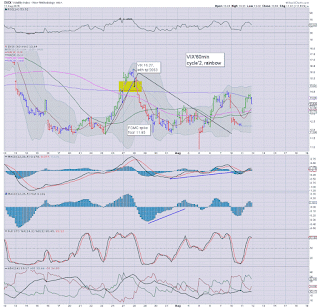 INTC -2.0%.. set for a daily close in the $28s. 26/25 remains primary downside... H/S scenario remains $22.50. 1.11pm.. As of writing.. the sp'500 is now BELOW last Friday's close of 2077.57.... and thus the 'Monday nonsense' has been FULLY NEGATED. 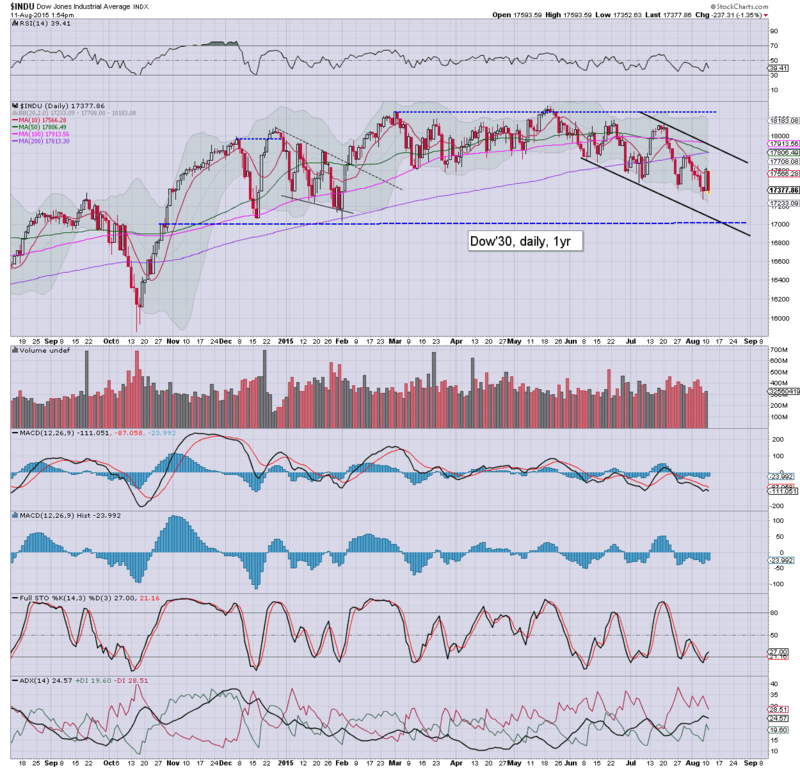 This is an extremely bearish signal.. and bodes for much lower levels this week... probably to the 2050/40s. 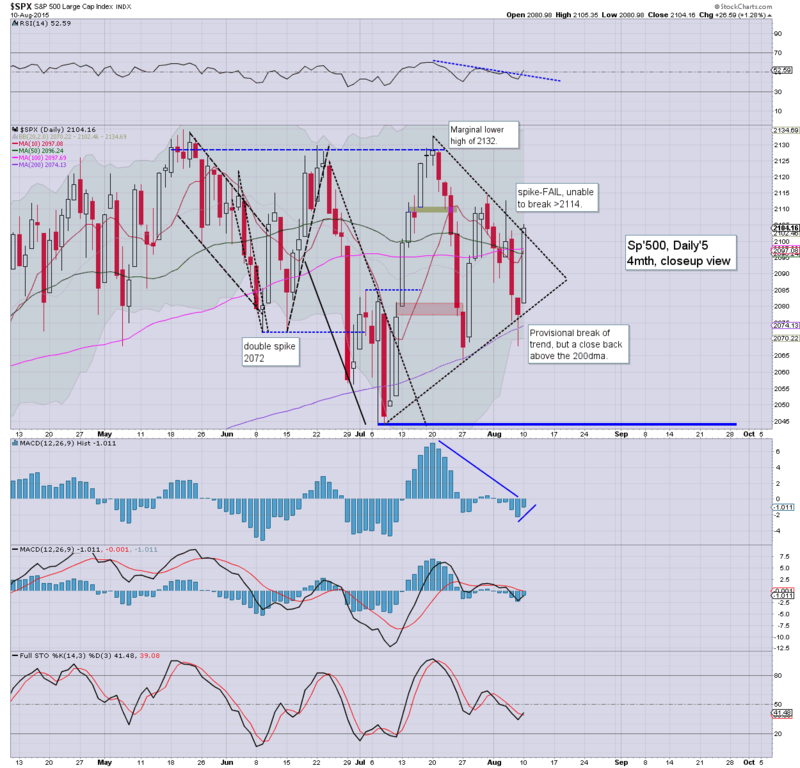 This will make for one hell of a reversal from the Monday high of sp'2105. US equity indexes are now significantly lower, with the sp -24pts @ 2079. Any daily close in the 2080s should satisfy the bears, but one under the Friday close of 2077 would be a major victory. VIX is battling for a key close >14.50. Oil remains naturally weak, -3.3% in the $42s, as supply just keeps on growing. *a daily VIX close >14.50 should (in theory) offer a more significant jump tomorrow.. into the 16/17s... which would likely equate to sp'2050/40s. So... we're already close to a full reversal of the 'Monday nonsense'... and that is going to really upset some of the bull maniacs out there who were touting new highs just yesterday. As ever... what matters is the daily close. For me... its all about the VIX... I want to see a close >14.50. time to lay down on a sofa... I'm burning out. US equities are seeing a little chop, but remain broadly lower, having already hit sp'2086.. with VIX 13.38. Indeed, VIX remains relatively subdued, and a daily close >14.50 remains absolutely necessary to give clarity and confidence to those seeking continued market weakness in the near term.. and across September. 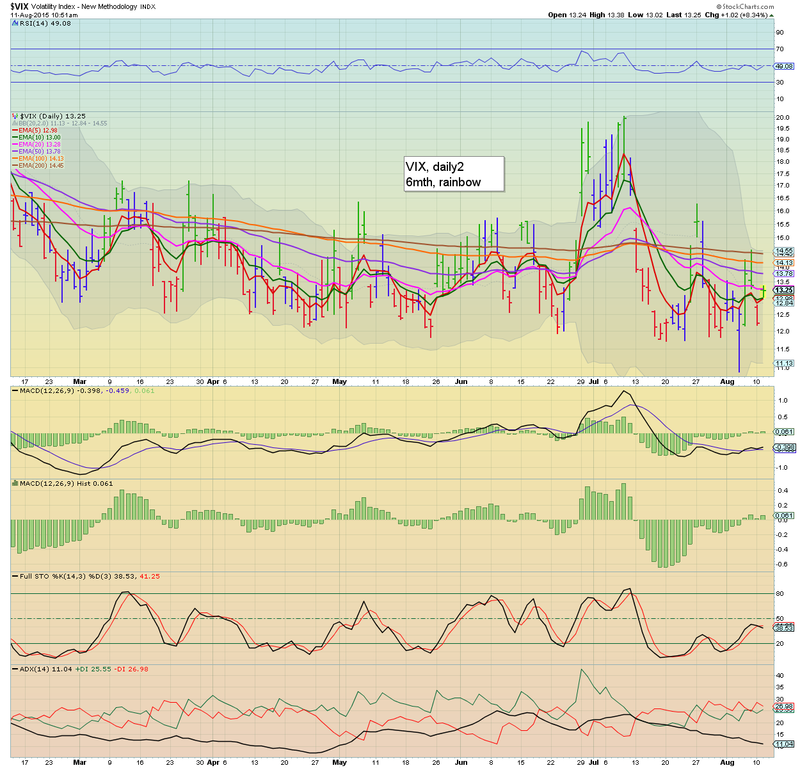 *we've an outright green bullish candle on the VIX, first resistance are the mid 14s. Any break >14.50.. and the market will spiral lower. Not surprisingly... we're seeing some chop... but we sure ain't seeing the dip buyers yet. For today, I think it is merely a case of seeing how we close. notable weakness: AAPL -2.6% in the $116s. Price structure remains a bear flag, having maxed out around the old broken floor of $119s The big $100 threshold remains an obvious target. 11.14am.. New lows.... VIX is pushing for the 14s. As noted... what would really matter is a daily close >14.50. US equities open moderately weak, and the bears have already negated over half of the 'Monday nonsense'. The bigger weekly/monthly cycles remain clear.. momentum continues to increasingly swing toward the equity bears. Oil is notably weak, -2.7%. *VIX remains relatively subdued. 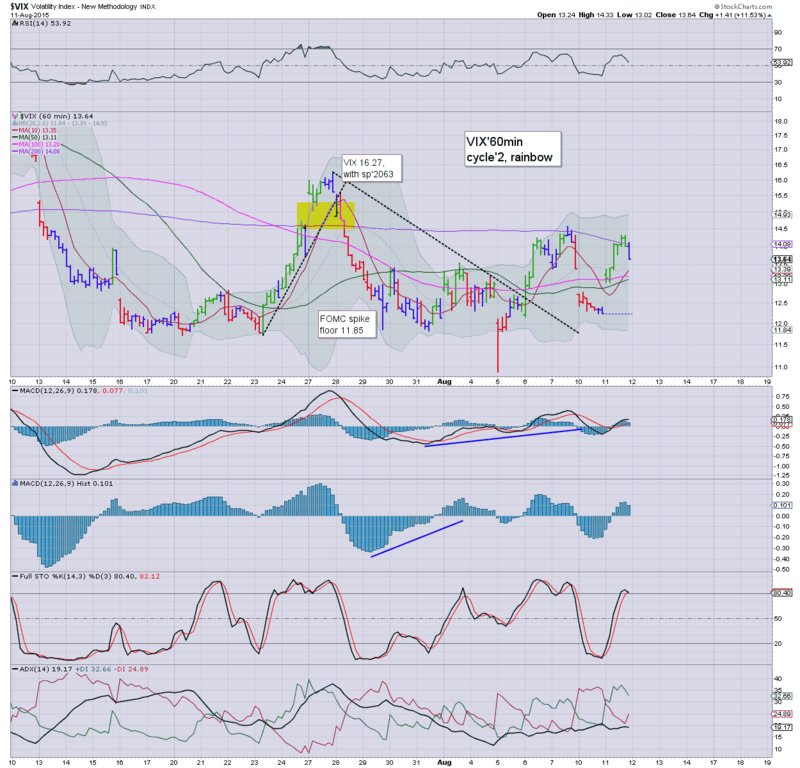 The bears MUST see a daily close >14.50 within the next few days to have any hope of continued equity weakness to sp'2050/40... never mind 2025/1975. So.. the opening losses are a major relief to those on the short side.... but bears need these declines to be built upon. notable weakness: copper miners, FCX -11%. time to cook.. or else I'm going to keel over. 10.01am. Wholesale trade data: 0.9%.. vs 0.4% expected.... certainly in favour of the econ-bulls. Good morning. Futures are moderately lower, sp -12pts, we're set to open at 2092. Despite China devaluing the Renminbi, the USD is fractionally lower, -0.1% in the DXY 97.00s. Metals continue to bounce, Gold +$6, whilst Oil remains broadly weak, -1.3% in the $44s. So.... now its a case of whether yesterday's nonsense can be fully negated across the next few days. Equity bears should be seeking at least a net daily decline in the 2095/85 zone. 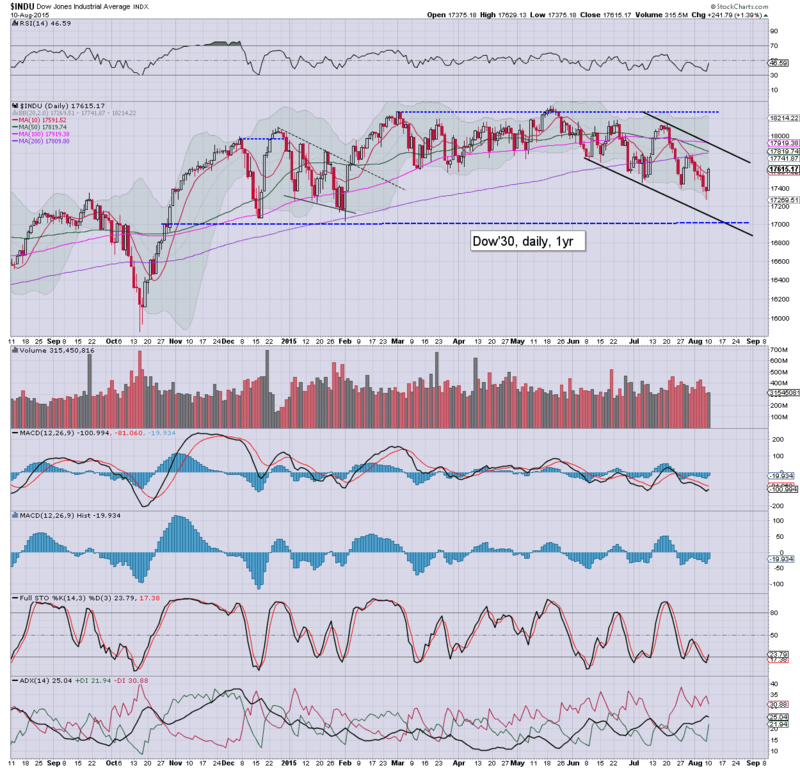 Preferably though,we'll close in the 2085/75 zone.. along with VIX 14s. Long day ahead.... and my head is already spinning with 'moving/house issues'. AAPL -1.3% in the $118s. Overnight China action: The Shanghai comp' closed essentially flat. 8.43am.. sp -15pts... we're set to open at 2089. Just another 11pts.. and we'll negate the entire 'Monday nonsense'. It would make for yet another stern reversal. notable weakness: TWTR -1.8% in the $28s.... headed below the IPO price of $26. sp -18ts... 2086.... that should equate to VIX 13.75/14.25 at the open. 9.34am. VIX +9%... 13.30s... that is somewhat disappointing. Anyway.. lets see where we close. 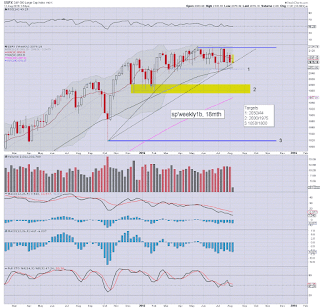 US equities have begun the week on a particularly bullish note, sp +26pts @ 2104. Yet, today's gains do little to negate the various bearish signals seen across the last few weeks. Unless the bulls can break the highs from not just last week (sp'2112), but July 20'th (sp'2132)... outlook remains bearish. 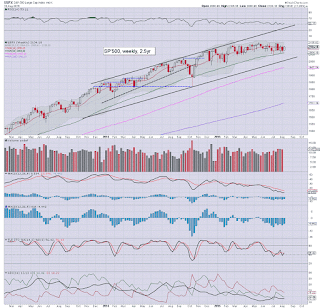 *Despite a net daily gain of 241pts (1.4%), the Dow monthly still looks pretty ugly. Right now, new historic highs >18351, look out of range for some considerable time. The broad chop since February continues. Increasingly, some are recognising that this is largely a correction across time.. rather than price. 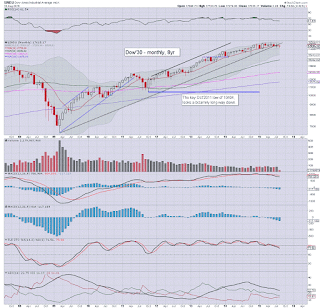 However, the even bigger monthly cycles are still offering a sig' correction of 8-12% into the early autumn. Of course, that won't satisfy most bears.... not least since it won't break below the Oct'2014 lows. Tuesday will see productivity/costs and wholesale trade. 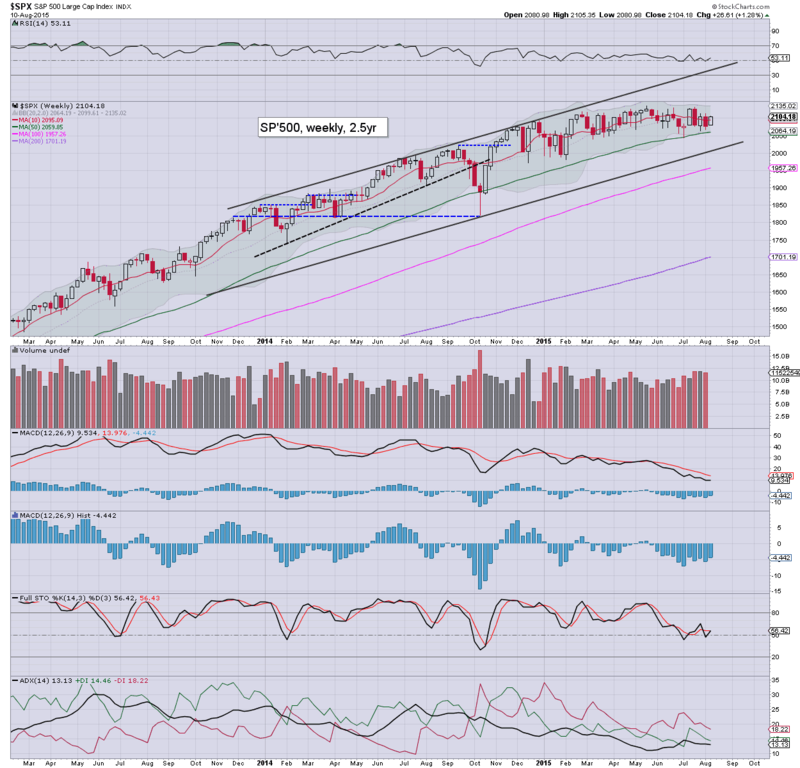 US equity indexes closed significantly higher, sp +26pts @ 2104. The two leaders - Trans/R2K, settled higher by 1.5% and 1.2% respectively. 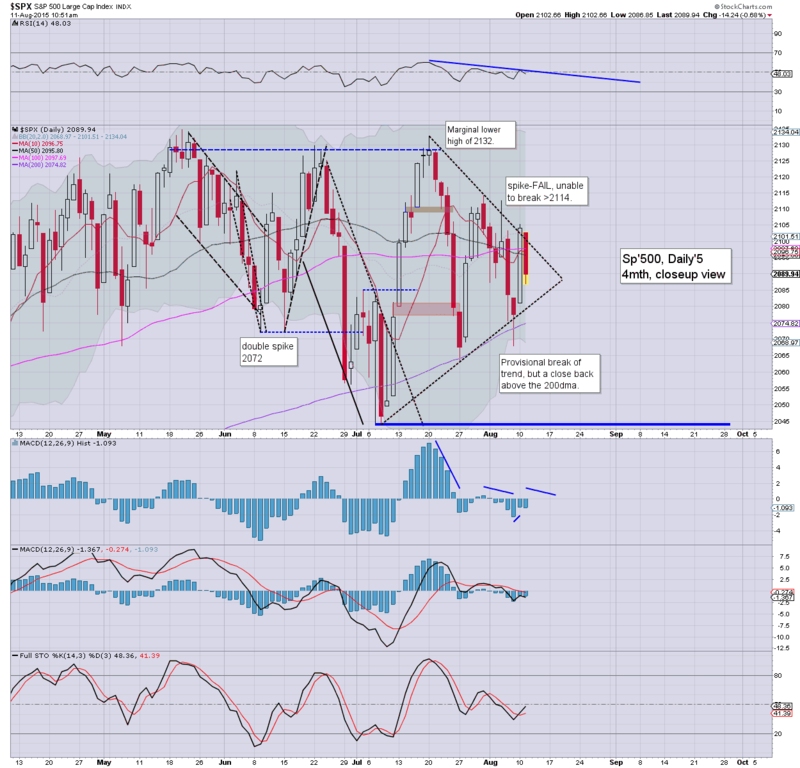 Near term outlook is now borderline, bears need to hold the market under the recent failed rally attempt of sp'2112. *The Dow (along with the NYSE comp') is set for a 'death cross' tomorrow.. or at the latest... Wednesday. From a pure technical perspective, it is a bearish signal.. but can often be so laggy as to be useless for short/mid term trades. A strong start to the week for the bull maniacs. However, the bulls need a decisive daily close above last weeks high of sp'2112.. otherwise, its just another failed rally.